During the Prohibition years from 1920 to 1933, alcoholic beverages were illegal in the United States. But it was still fairly easy to get a drink. 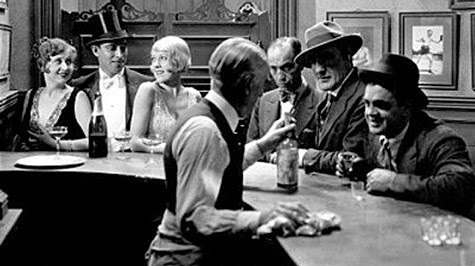 One of the easiest ways was to find a speakeasy—a hidden bar that served bootleg liquor and that often required a password to get in. Legend has it that the name speakeasy came from patrons being told to “speak easy,” or softly, so the police wouldn’t hear the party. When the Volstead Act, which put Prohibition in place, was repealed in 1933. But if you want to revisit that time in a new way, you have your chance because modern speakeasies have popped up all over the country. These bars take the mystery and romance of history and create a fun atmosphere. At Mystery Playground we love to visit speakeasies when we travel. 1) Individually mixed drinks with fresh ingredients, often invented at that bar. We’re talking fresh, muddled fruit and innovative concoctions. A far cry from the quality of spirits found in most speakeasies back in the day. This also means you pay more than you would for an average cocktail, and depending on the city you’re in, it can be a lot more. 2) An unmarked door or a misleading sign. You have to know where the speakeasy is. Most doors are unmarked, but I’ve visited one behind the façade of a Fortune Telling shop and another where you had to go into a restaurant and pick up an antique phone to gain admittance. 3) Reservations are commonly a must, and many times, you’ll need a password. It pays to do your research. I’ve never had trouble getting into a popular place—as long as I made a reservation and knew in advance if I needed a password. 4) An intimate atmosphere with lots of attention from your bartender to help you get exactly what you want. These places are small (thus the need for reservatinos), and the décor is well planned. Many of the speakeasies even play the music of the time. There are several speakeasies in Manhattan, but so far, Raines is my favorite. They seat people in parties of two who don’t know one another together, and by the end of the evening, we had met new friends. The drinks were fabulous and in the summer you have to try and sit out in their beautiful little garden. Reservations are a must. This wonderful little bar has excellent music, great drinks and the menus hidden inside of vintage books. 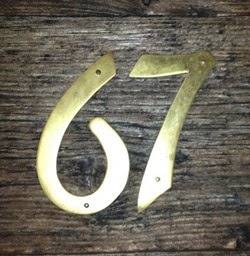 67 Orange Street serves great food as well. They do not require a password, but you should know, the bar is not on Orange Street. There’s a story behind the name. Once inside, ask for the Emancipation. Single Barrel’s claim to fame is that the bartenders interview you to discover your perfect drink. The process takes awhile so the bar can get a little backed up, but it is worth the wait. Reservations are recommended and there isn’t a password. Don’t speak too loudly or you may get shushed. The drinks here are fabulous and you get to sit in big velvet couches. The Lady Silvia is ideal for anyone who likes to venture away from The Las Vegas Strip. This place is right around the corner from the Gold and Silver Pawn Shop of History Channel fame. We didn’t go there, but we saw the line… Chumley has a lot of fans. This little gem is hidden behind a Fortune Teller façade right down the street from the Beverly Center. We went right at opening, and didn’t need a reservation. I’m sure if you went later, you would. The décor is insane, the drinks and bartenders, fabulous. (See sign above.) Part of this bar used to be an actual speakeasy, I say part, because there are four rooms and only one was the speakeasy. In those days, the upper level was a cigar shop, and you needed to ask for a certain type of cigar to be admitted to the basement where drinks were served. You need a reservation and a password for all rooms and they don’t serve drinks in the basement. The Library only requires a password, not a reservation. 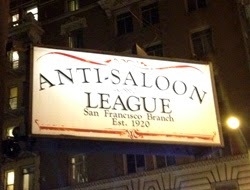 This place is fabulous, from its cute, unmarked location in a corner-shaped building, to the creative and tasty drinks. When you go, be sure and ask for the Egret, although my friend had the Painkiller and he loved it. We also had a flaming goat cheese fondue that was yummy beyond description. Reservations are made by text that same day. You do not need a password. You do need to go next time you are in Seattle. 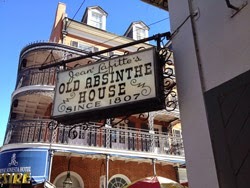 The first thing you need to know is this place is on Bourbon Street in the French Quarter and it is not quiet, intimate, quaint, or charming. The second thing you need to know is that Jean Lafitte was an actual pirate who decided to put aside his pirate life, supposedly in this bar, to save New Orleans from the French. Old Absinthe has been in the same location for 200 years, except when it relocated to a warehouse down the street during Prohibition. For some reason it has become a tradition to staple your business card to the walls of the bar. You don’t need a password. The “VTR”, as it's known by locals, used to be a real speakeasy, and even has the bullet holes in the ceiling to prove it. It has a reservation-only, super-secret backroom. The VTR uses egg whites in lots of its drinks, because so many drinks during Prohibition used them. They go through many dozens of eggs each evening. I haven’t been fortunate enough to visit the Velvet Tango Room myself and I have to thank my friend Kim for the salient details. She promised to take me next time I come to town. More spy house than speakeasy, this place is pure, campy fun. Don’t miss the tube that runs through the restaurant, making martinis James Bond style— shaken, not stirred. There are cute little rooms with beaded doors, perfect for meeting a double agent. Signs with bullet holes and gun-themed tablecloths are at every turn. They serve drinks and dinner, but with so much attention on the theme, perhaps these things suffer. Still, it’s so worth a visit. Oh, and yes, you will need a password, an exact password. For those who get it wrong, there is a punishment in store. But don’t worry if your cover is blown. There is a secret exit that would make Maxwell Smart proud. So there you have it. A mere smattering of the multitudes of modern speakeasy bars across the country. If I didn’t cover one near you, you might try searching Yelp for “speakeasy” in your area. They seem to be more prevalent in big cities. Most importantly, if you have a favorite speakeasy that I didn’t cover here, I’d love to hear about it. I have started taking friends and colleagues to speakeasies whenever we travel, and we have never failed to have to have a great time. You can read about other Mystery Playground speakeasy adventures here.